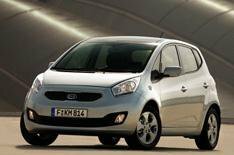 Kia unveils Venga MPV | What Car? This is the Kia Venga, the production version of the No.3 concept car that was shown at the Geneva motor show earlier this year. Based on the same platform as the Kia Soul and the Hyundai i20, the Venga will be a rival for cars such as the Citroen C3 Picasso and Nissan Note. The Venga will come with a choice two petrol engines a 1.4 or a 1.6 and a 1.6-litre diesel. Kia's engine stop-start system will be available on all three engines. Expect a bright and airy cabin on some models, thanks to a tilt-and-slide all-glass panoramic roof, while all versions will have a 60/40 split rear seat that folds flat into the floor. Kia says the name 'Venga' has Spanish origins and 'has a modern polished feel'. It is not, however, a misspelled attempt to flatter the Arsenal football manager or even a homage to the 1990s dance outfit the Vengaboys, which produced classic tracks such as 'Boom, Boom, Boom, Boom!! ', 'We're Going to Ibiza' and 'We Like to Party'.